Tonight I fixed Thai Peanut Noodles for dinner. I am not necessarily a big fan of a peanut sauce, but tonight’s dinner was great. This recipe took just a few minutes to fix which makes it a great after work dinner. Mix all these ingredients into a pan and heat until the peanut butter melts and everything comes together. I decided to take the easy route and put all of these ingredients into a Pyrex bowl and microwaved it for 30 seconds, then whisked it all together. 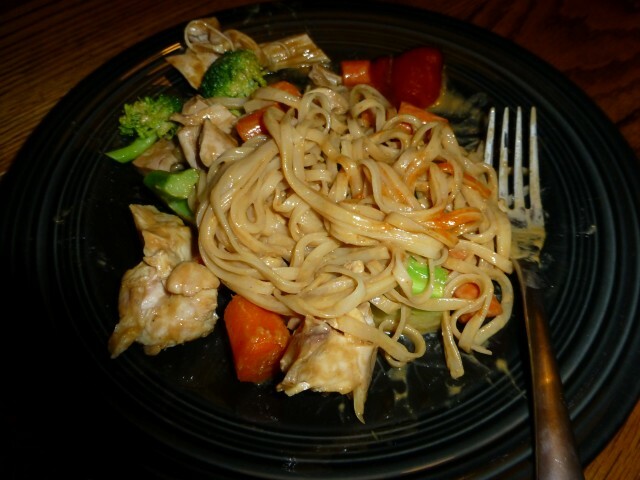 I served this sauce over rice noodles which were mixed with steamed broccoli, carrots and a left over chicken thigh. I think a bit of lime juice would have really brightened up this dish, but I didn’t buy any. This recipe made enough sauce for two full servings of noodles (which I will eat tomorrow for lunch). By Tim in Food on January 3, 2013 .